Jetpack helps you tackle this along two fronts: attracting new visitors to our sites and encouraging the existing ones to keep coming back. Publicize simply automates what you probably do already: posting your articles directly to Twitter, Facebook, LinkedIn and a few more social networks. Once you set this up (about 5 minutes usually) you can sit back and not worry about this and focus on writing great content while your friends and followers read what you’ve just posted. The Sharing feature, when enabled, places share buttons at the bottom of your blog posts. This allows (and encourages!) your readers to share your content with their own networks giving you broader reach. Currently we supprt Twitter, Facebook, Reddit, StumbleUpon, Digg, LinkedIn, Google +1, Print, and Email. Additionally you can define your own custom services. Verifying your website with external services like Google, Bing and Pinterest. This means you will be rated as “safe” by these services (e.g. by getting a “Verified” badge) and gives you to access advanced features (e.g. Webmaster tools). At WordPress.com we have a service called “Firehose” which is a stream of the public data (public posts, comments, etc.) that flow through WordPress.com as well as Jetpack blogs that enable Enhanced Distribution. The firehose in turn is used by companies and people to display your content at which point they are required to link back to your blog. This means that you get both traffic back to your site as well as building up quality back-links. Lastly, when you activate and connect this feature you connect your blog and with your Google+ accounts. Now, displayed below your posts, will be a link back to your Google+ profile, a Google+ follow button and a link will also be added to your Google+ profile allowing Google+ users to find you more easily. The other side of the coin is staying in touch with the visitors who’ve seen and read your content so that they don’t forget about you and come back to see what else you have to say. You may not necessarily want to use all of these of course as it depends a lot on the kind of site or blog you’re running. But because Jetpack makes it easy to turn these on and off some of our users opt to try things one at a time to test out their effect. Comments are a great way of enabling your visitors to join the conversation. It can be a pain for them however to have to creat a new account if its their first time visiting your site. Jetpack Comments enables your visitors to use their existing WordPress.com, Twitter, or Facebook accounts when commenting on your site making it more likely they’ll do so. RSS is used by millions of people to keep track of blogs they like. When you enable Extra Sidebar Widgets in Jetpack you can show widget that allows you to add links to your blog’s RSS feeds in your sidebar. This makes it easy for your readers to stay updated when you post new content or receive new comments. Likes allow your readers to show their appreciation for your posts and other published content. They will then be able to review their liked posts from their WordPress.com Reader which will remind them your blog exists and encourage them to come back. Easily allow any visitor to subscribe to all of your posts via email through a widget in your blog’s sidebar. 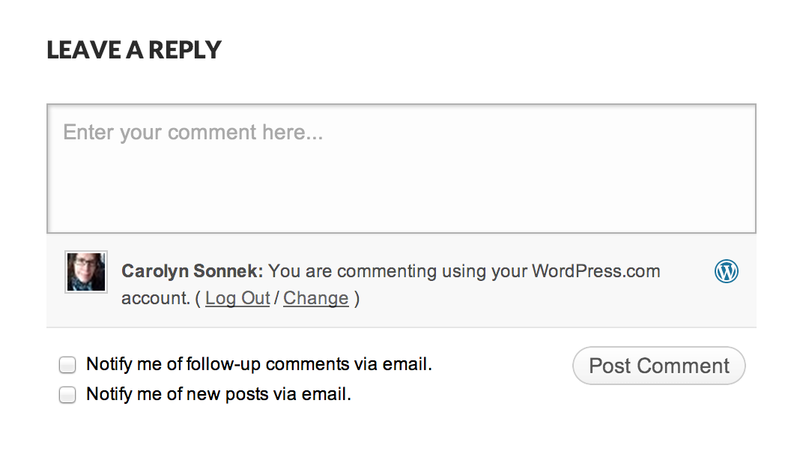 Every time you publish a new post, WordPress.com will send a notification to all your subscribers. Depending on their preferences this notification will either show up on their WordPress bar (top right) or they will receive an email directly in their inbox. Finally, this last one is for you, the site owner. With Notifications enabled you will be instantly notified when somebody comments on any of your posts or previous comments. This means that you can instantly comment back making your interaction with your readers feel more personal and in real-time. And of course, Jetpack also gives you great stats so that you can see the effect of your work! If you’ve not used Jetpack before, read our step-by-step installation guide here to try it out for yourself. If you are a Jetpack user already please tell us what you think in the comments and, if you’d like to get involved by writing a guest post about Jetpack get in touch! This entry was posted in Tips & Tricks and tagged blog traffic, Comments, Facebook, Jetpack, sharing, Social Media, Twitter. Bookmark the permalink. a bit disappointed in jetpack’s “publicize” feature. connections drop off without an alert, for example facebook is no longer getting my posts. i think i will just post individually, so that both video link & text appear, but also to insure they arrive safely! 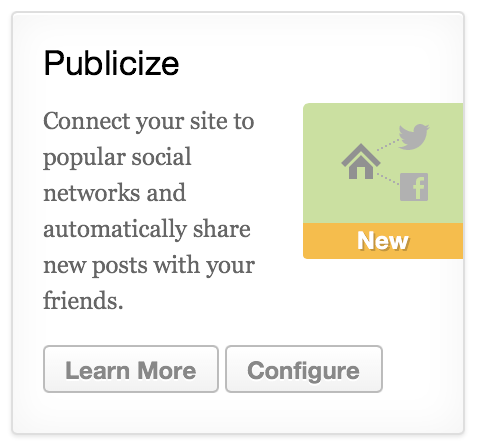 If you experience issues with Publicize, do not hesitate to send us an email! We’ll be happy to take a look and help! sharing with Google+ is working, though the number of votes is not displayed. Try it here on this blogpost: no number in the share this button. How frequent is jetpack updated? I think this is kind of a major bug (from my point of view) but I got no answer in your forum. And no fix nor update yet! I love Jetpack comments and Google+ Sharing feature the most. These are the backbone of my career website. Good to hear that Pushpendra. Is there anything you’d like to see improved? We’re always looking for feedback.